Based in Andalusia, we specialise in providing exciting and interactive visits for Spanish Language groups with excellent customer care by our local host and service team 24 hours a day for no extra costs. Our aim is to make visits interesting and fun, ensuring that your students return to their studies motivated and inspired by an unforgettable learning experience. The trip had been well organized, with many interesting activities and places to see. Well another fantastic trip thanks to the amazing efforts of Hispanglia! The guide was superb and interacted so well with all of the students. … everything went like a dream and I don’t think we could have had a better time. We had a really good time in Malaga, children enjoyed too much and we had lots of positive feedbacks from parents! The four day trip to Malaga was fantastic for our students. En una palabra: ¡¡genial!! It was a fantastic trip overall. The organisation was brilliant and the choice of places to visit perfect. Everything was so well organised and again the mix of activities covered so many learning experiences. …such a wonderful experience from which we’ve learnt a lot. Thank you very much for organising such a great trip – the students all said what a great time they had. We offer a wide variety of Subject-based trips to Andalusia for students of all ages: Flamenco Music and Dance, Drama, Mediterranean Cuisine, Art, History, Tourism, Ski and Multi-adventure activities. Based in Malaga, the programme integrates Spanish lessons in the mornings with a varied mix of cultural activities in the afternoon. Inhabited for more than 2,000 years, Andalusia offers the visitor an incredibly rich monumental heritage and a dazzling natural environment. If we add up the sunshine, the traditional feasts, the flamenco dancing and the great food you will agree that Andalusia is the perfect destination for everyone, come and discover it! 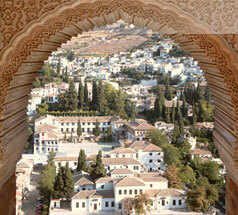 Discover the magic of Andalusia in a truly unique experience with HISPANGLIA Culture & Trips!